The Toyota 2.7-liter engine called as the 2TR-FE appeared in 2003. It is a four-cylinder gasoline engine used mostly in Toyota’s SUVs and RWD/4WD pickups. This 2.7l engine of the TR family successfully replaced the old 3RZ-FE engine. The engine was built around cast iron cylinder block borrowed from the 3RZ engine. The engine block has twin counter-rotating balancing shafts for vibration and noise reduction. There is a forged fully-balanced crankshaft with eight counterweights and torsional rubber damper. 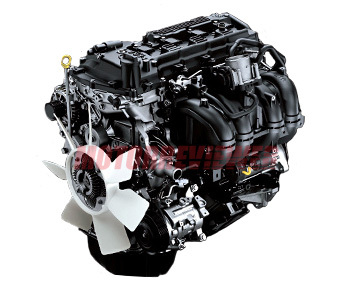 The 2TR engine is a square engine – it has equal 95 mm (3.74 in) bore and stroke dimensions. Inside the cylinder block, there are oil jets for cooling of the aluminum alloy pistons. The 2TR-FE engine received an entirely new aluminum cylinder head. It has four valves per cylinder (16 valves total) and double overhead camshafts. The valves are actuated by roller rocker arms. The valvetrain is equipped with hydraulic lash adjusters (no valve clearance adjustment required). The engine also uses a timing chain to rotate the camshafts. For the intake camshaft, engineers installed the Toyota’s VVT-i system (Variable Valve Timing with intelligence). After 2015, when the engine was slightly upgraded, the VVT-i became available for both intake and exhaust camshafts – Dual VVT-i. The engine is naturally aspirated and has a simple and cheap plastic intake manifold. The throttle body is electronically controlled by Toyota’s ETCS-i which means no mechanical connections just wires and accelerator pedal with a position sensor. Of course, the modern engine cannot be imagined without a fuel injection and electronic ignition. In this case, the 2TR engine was equipped with a sequential multiport fuel injection system (EFI) and Toyota’s DIS (Direct Ignition System) system with individual ignition coils for each cylinder. The Toyota 2.7-liter engine has a short list of common problems and failure but they exist. This is a modern engine with complex electronic systems which require good oil, fuel, and proper maintenance. The engine produced until 2008 had oil leaks from the front crankshaft oil seal. Most of them are already repaired and a bad seal was replaced by revised new one from the newest models. The main issue is what the engine doesn't fit its applications. It is too weak for heavy SUVs and pickup trucks and most of the time overloaded which cause high fuel consumption and noisy operation. But the reliability is a strong side of that engine. The engine life of the 2TR-FE is about 250,000 miles (400,000 km).